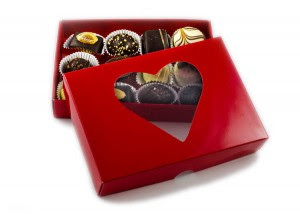 Jagruti's Cooking Odyssey: Free Giveaway - Genevie Red Heart Chocolate Box ! Free Giveaway - Genevie Red Heart Chocolate Box ! It's February 14th, and that can only mean one thing - Romanticism IS IN THE AIR....Card shops displays unforgettable cinematic valentines day cards.. bars and restaurants try to make the atmosphere very romantic, by creating the right décor and playing the right music; special menus are organised under the soft rythm of love songs and with a bottle of tasty wine. Sweethearts usually give each other gifts, flowers and chocolates in heart-shaped boxes. Somehow chocolate and Valentines day goes hand in hand. So what special plans you have this Valentines day ? Do let me know because I need to know and in return you'll have something from me. These generous people from Chocolate by Genevie are giving away a box of Red Heart Chocolate to my readers. Isn't this wonderful ? Excited....want to get delivered this lovely chocolate box to you ? , then just follow few guidelines and enter this competition..
A classy red satin box with a heart shaped clear window; an ideal gift for valentines day! The box contains mouth watering mixed Belgian chocolates beautifully presented. The chocolates are sent in a special outer box that is letter box friendly. Leave a comment on this post saying how are you going to be spending your valentines day ? Then gain more entries via Rafflecopter. If you're not a blogger, still you can enter this competition. Leave your comments as Anomous but put your name down in the comment box and carry on with rest of entries. THE GIVEAWAY CLOSEs ON 12th February 2013. Entry is via Rafflecopter....Good Luck ! I'll be having a night in with my boyfriend - pizza and a movie! we will be spending the day out and will find somewhere nice to have a picnic. Will be celebrating a homely lunch at my place with my family. Having a nice meal with my son and partner! I'm going to eat lots of chocolate! i will be spending valentines with my best friend at a speed dating event. i'm gonna do a lovely meal for my partner as it's his birthday on Valentine's day! I have no plans at the moment ,it's just a case of wait and see! I'm gonna be all by myself, I have friends but no romantic partner, so these would really cheer me up! I will be spending a cosy, romantic night in with my new boyfriend, the food is being cooked by my chef neighbour.